The Week 11 bye gives head coach Kyle Shanahan his best opportunity to evaluate his team — a team that lost it’s starting running back before the season started and it’s star quarterback just three games in. 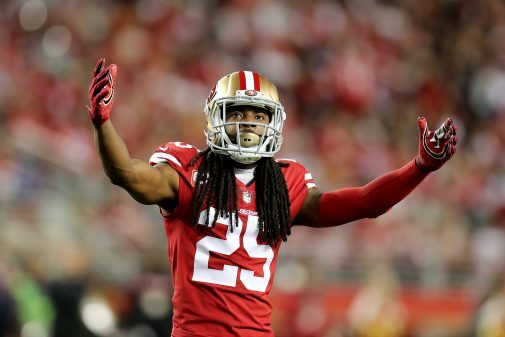 The defensive unit has dealt with less-severe but more frequent injuries, disjointing an already very inexperienced group whose only anchor is Richard Sherman, one of the many on that side of the ball who has battled through his own injury issues. San Francisco 49ers’ Richard Sherman (25) fires up the crowd in the second half as the Oakland Raiders face the San Francisco 49ers at Levi’s Stadium in Santa Clara, Calif., on Thursday, November 1, 2018. Despite losing Jerick McKinnon and Jimmy Garoppolo, the 49ers offense has managed to tread water fairly well thanks to the running game. 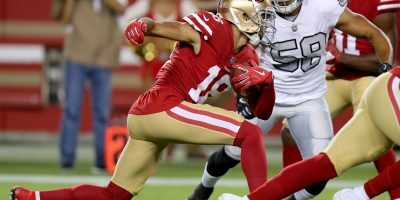 Matt Breida, Alfred Morris, and also-lost-for-the-rest-of-the-year Raheem Mostert have formed the league’s fourth-best rushing attack, averaging 133.6 yards per game. 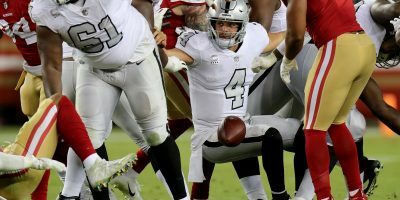 While their quarterback play has been understandably mediocre, the offense is averaging a respectable 23 points per game, ranked 18th in the league. Defensively, they’ve actually been very good, for the most part. 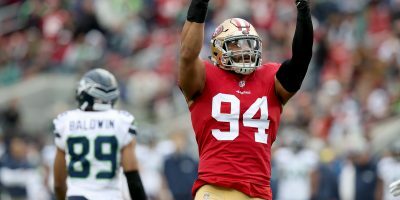 The 49er defense has been well-balanced in its approach, ranking 14th in passing yards per game allowed (242) and 13th in rushing yards per game allowed (102.2). But that success hasn’t translated to point-prevention, where the 49ers rank 27th (26.6 points per game allowed). 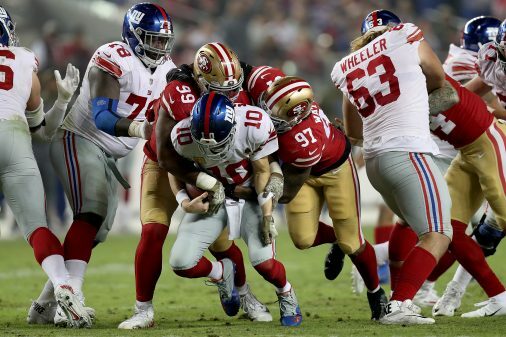 San Francisco 49ers’ linebacker Dekoda Watson (97) and San Francisco 49ers’ DeForest Buckner (99) bring down New York Giants starting quarterback Eli Manning (10) as the New York Giants face the San Francisco 49ers at Levi’s Stadium in Santa Clara, Calif., on Monday, November 12, 2018. However, that statistical disparity is due largely to the offense’s turnover rate. San Francisco has the third-most giveaways (20) so far, which has put their defense in poor situations. 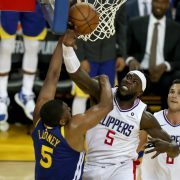 And that defense has been unable to return the favor, currently ranking last in takeaways (5). To put this into perspective, Buffalo has the top-ranked overall defense (302.2 yards per game allowed) and ranks eighth in takeaways (15), yet the offense has turned it over 22 times. The Bills have won just three games. It’s impossible to win consistently when an offense can’t hold onto the ball. The only bright spot aside from the ground game has been George Kittle. In a relative sense he’s been the best tight end in ht e league this year. Unlike other elite tight ends like Travis Kelce, Zach Ertz, Rob Gronkowski and Greg Olsen, he hasn’t had regular, top-tier quarterback play. 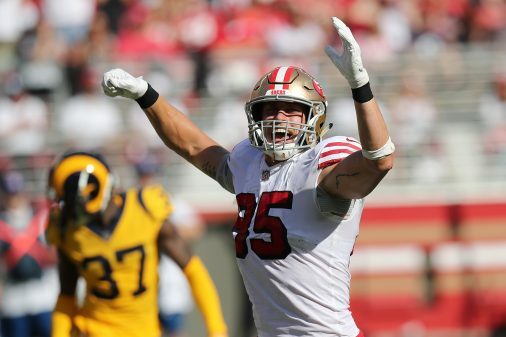 San Francisco 49ers’ tight end George Kittle (85) celebrates a second quarter touchdown as the Los Angeles Rams face the San Francisco 49ers at Levi’s Stadium in Santa Clara, Calif., on Sunday, October 21, 2018. 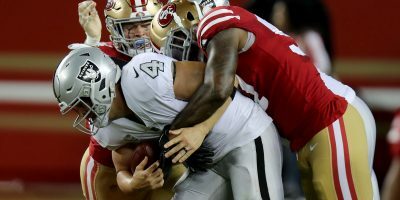 Kittle has sustained his production with two backup quarterbacks and a lack of reliable receiving partners. After his 775 receiving yards, Marquise Goodwin ranks second on the team with just 339 yards. 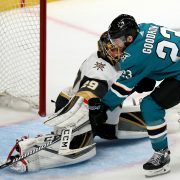 Shanahan and every member of the roster has refused to make excuses, which is the professional approach. However, their excuses are legitimate. 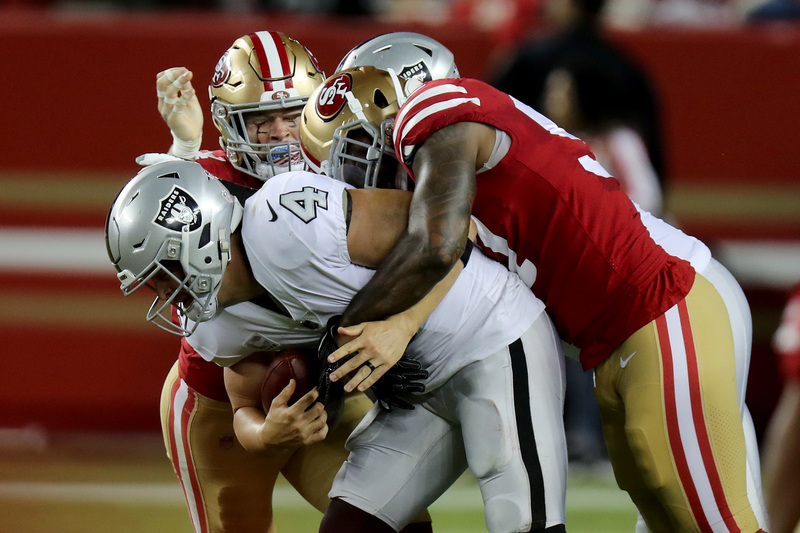 Under-performance and poor effort aren’t the culprits for the 2018 49ers. They’ve been forced to salvage a season that began to trend downward before it could accelerate. 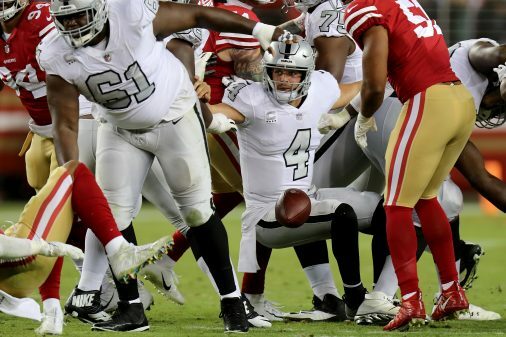 Oakland Raiders starting quarterback Derek Carr (4) loses the ball as he is brought down in the second half as the Oakland Raiders face the San Francisco 49ers at Levi’s Stadium in Santa Clara, Calif., on Thursday, November 1, 2018. The hidden gem from this tough-luck season is valuable experience. An offensive line having to block better for quarterbacks that don’t decipher plays as quickly as Garoppolo. A tight end emerging into a star out of necessity. A defense having to compete as it patches itself together due to ebbing and flowing injuries. A 2-8 record is nowhere near where this franchise wanted to be, but the trial-by-fire could be a big catapult for success in 2019.